The Magento 2 Trust Badges of Mageplaza One Step Checkout provides store owners the permission to add in trust badges to store checkout page. The store admins can felixibly use any types of badges like suggested badges or even upload other kinds of seals to suit with the businesses. Besides Trust Badges, Order Comment feature is another feature that can be used easily to have more detail about each order to deliver precisely according to what the customers ask for. It can be easily performed its task right on the checkout page. If you are curious, please click here to reveal many appealing features of it. In shopper’s view, when the means to purchase have innovated to become convenient, there will be higher chances customer will get tricked. In the worse case, their personal information and their bank account information can fall into the hands of fraudsters. This frauds often cause doubt from customers to other reliable stores. As a result, many stores fail to increase conversion rate due to lack of trust. Using the Trust Seal helps customers have more faith in your business reliability. Especially, adding trust seal is a wise solution to mitigate hesitation when carryout payment process. There will be less doubt about your store prestige and also the customers do not have to waste time to research about store information. The Trust Badges developed for Magento 2 is positioned under Place Order block which is very easy to spot. Trust Badge main responsibility is delivering the store’s commitment to protecting customer confidential information. Also, stores just need to properly embed the trust badges by contacting to your SSL or Security provider. Hence, the abandon cart rate will reduce along with the considerable rise in conversion rate as well. The Trust Badges will be displayed under the place order. This is a suitable position to place this in order to hasten the decision to make an order. This colorful badges will make the checkout sites to appeal reliable and lively. There is no limitation for owners to show the trust badges as they can upload any seal that they want buyers to view. Before enabling the Trust Badge, you need to log in your admin account and then select Stores > Settings > Configuration > Mageplaza Extensions > One Step Checkout. Next, scroll drown and enable the Seal Block. Please Select Static Block, if admins want to apply the CMS block to display as a seal block. A variety of block options is supported by the feature. Thus, the seal block default can help admins create Seal Content for One Step Checkout. When the CMS blocks do not suitable with store theme or purpose, you can easily choose Use Default Design to add or edit images and contents in a short amount of time. 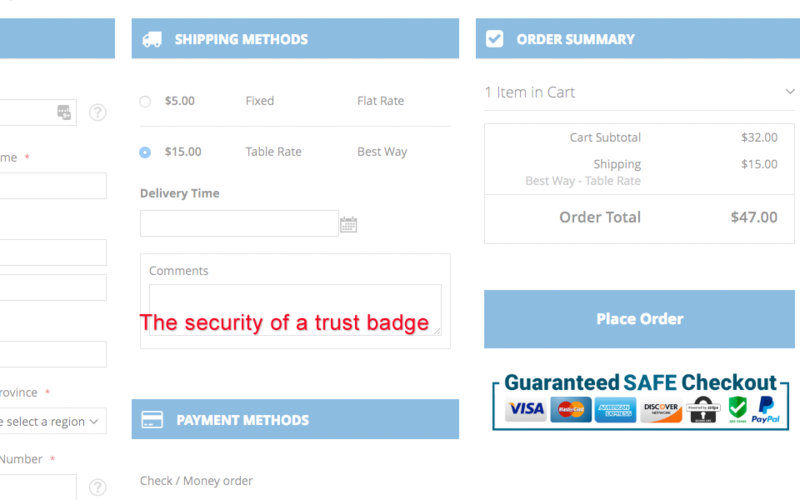 If stores do not want to use this feature display any type of trust badges in Onepage Checkout then you can choose No to disable.